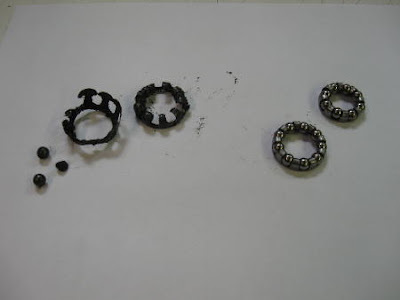 On the left are a set of ball bearings that Derrick in Peninsula recently removed from a customer's bike, even that misshapen one that looks like a piece of gravel. On the right are what the same bearings look like brand new. The bottom bracket is the assembly that connects your pedal crank arms to the bike. If yours feels loose and/or makes awful noises, then it's possible it looks something like the one on the left! Typically these days, we'd replace the old-style caged ball bearings shown above with a sealed cartridge bottom bracket unit, like the one shown below. It's not much more expensive, and it's much more durable and easier to maintain. This is just one of the many services our expert mechanics at all three Century Cycles stores can do to keep your bike rolling smoothly and safely! To learn more about the bottom bracket and its many variations, see this past Tech Talk article on this blog. Stolen BMX now in stock! This just in: Giant Expressway unfolds and goes!